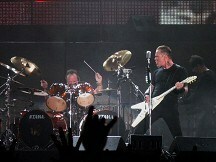 The group said it would perform the self-titled classic, known to fans as The Black Album, in full to celebrate the 10th anniversary of the heavy metal festival. Band co-founder and drummer Lars Ulrich said: "Six years is way too long to be away from the hallowed grounds of Donington Park. We are beyond psyched and feel privileged to come back once again to soak up the energy and vibe of the most legendary of festival sites." It will be the band's eighth visit to Donington Park. They played at the Monsters of Rock festival in 1985 and headlined Download festival in 2006. Andy Copping, vice president of promotions at Live Nation, said: "I am absolutely bowled over that Metallica will be playing The Black Album at the 10th anniversary of Download. "The album is up there as one of the greatest albums of all time, everyone knows the songs. "The Download festival has come a long way since we first started in 2003 and to have Metallica back to help us celebrate this milestone is just fantastic." The Black Album was number one in more than 25 countries and has sold more than 25 million copies worldwide. It includes hits Enter Sandman, Sad But True, Wherever I May Roam, Nothing Else Matters, and The Unforgiven. Download 2012 takes place from June 8-10. Tickets go on sale at 9am on Friday November 18.